The global market is projected to reach $590.5 Million by 2020, at a CAGR of 6.5% between 2015 and 2020. In 2014, the market was dominated by Asia-Pacific, followed by North America. The Asia-Pacific market is projected to grow at the highest CAGR, with rapid growth in the lipase market in developing countries such as China and India. The growing awareness about animal health and the rising consumption of meat and processed milk products are the major factors anticipated to drive the growth the market in this region. The key players were observed to prefer new product launches & developments, acquisitions, agreements, and expansions as strategies to capture a larger share in the market. The report also analyzes the market dynamics, winning imperatives, and issues faced by leading players. The research study has categorized the market on the basis of source, application, and geography. 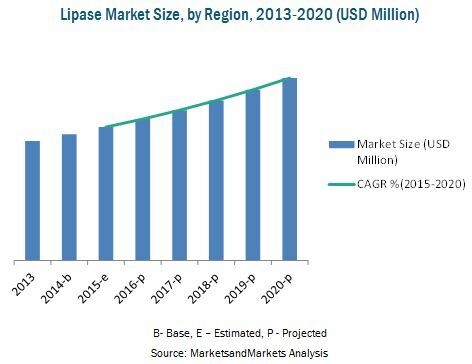 The growth of the lipase market is fueled by the growing awareness about animal health and rising consumption of meat and processed milk products. Numerous health benefits of lipases to improve health of the livestock have led to a large-scale adoption of lipase in various animal feeds in the global market. As an ingredient in food industry, it helps improving food quality and enhances the flavor of certain food items, improves their texture, prolongs shelf life, and increases the softness in some food products. The increasing demand for improved quality of meat and processed dairy products is driving the demand for lipases in animal feed and dairy application segments. Lipases are largely used in the animal feed, dairy, bakery, and confectionery industries. 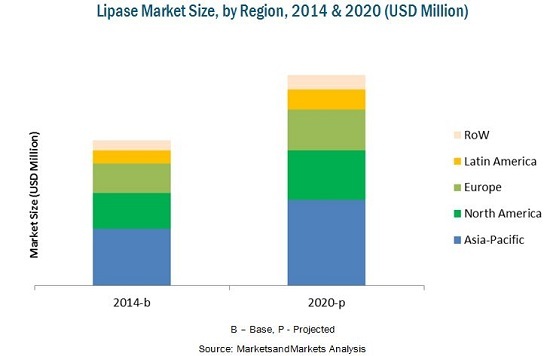 The lipase market has been segmented based on source into microbial lipases and animal lipases. Based on application, the market has been segmented into animal feed, dairy, bakery, confectionery, and others. The market has also been segmented on the basis of regions, into North America, Europe, Asia-Pacific, Latin America, and Rest of the World (RoW), and has been further segmented on the basis of their key countries. This report includes market sizes in terms of value (USD Million) and volume (MT).